Harvesting and drying dill. Later in the season when the flavor is stronger, I will freeze it instead. The only serious garden work I am keeping up with is the &^%^&^%$%% lawn. Most everything else is in a holding pattern requiring very little in the way of labor intensive attention. However, the first harvest of spring greens, strawberries, and peas is ramping up. My turnip, beet, and radish greens are coming in fast enough now that my family faces the prospect of one more wilted green side-dish with something like polite, smiley-faced lock jaw. Because my spring planting of cool weather greens is a small one (I will plant a larger crop for fall) I don’t typically have enough at any one time to serve as a hot dish (the soul food “mess o’ greens) or enough to freeze. I still need to find ways to preserve what I have. I solve this delightful dilemma by pickling them! Before you pull a face and wonder “what in the world is she on about? !” keep in mind that human beings have been pickling vegetables since ancient times. The sauerkraut you put on a summer brat is a pickled cabbage, not so very different from Korean kimchi or Japanese tsukemono (pickles). The procedure we use to make pickled cucumbers, relishes and chutneys are also not so very different. Here are the two simplest and most versatile ways I like to pickle spring greens. One method, the older, traditional European method, is the one Ma and Pa Ingalls used to preserve their garden harvests. The other is what I refer to as a Quick ‘n Tasty vinegar-based refrigerator pickle. They both take very little prep time. Both have a thousand and one variations and can be “tinkered” with to suit your particular taste buds. 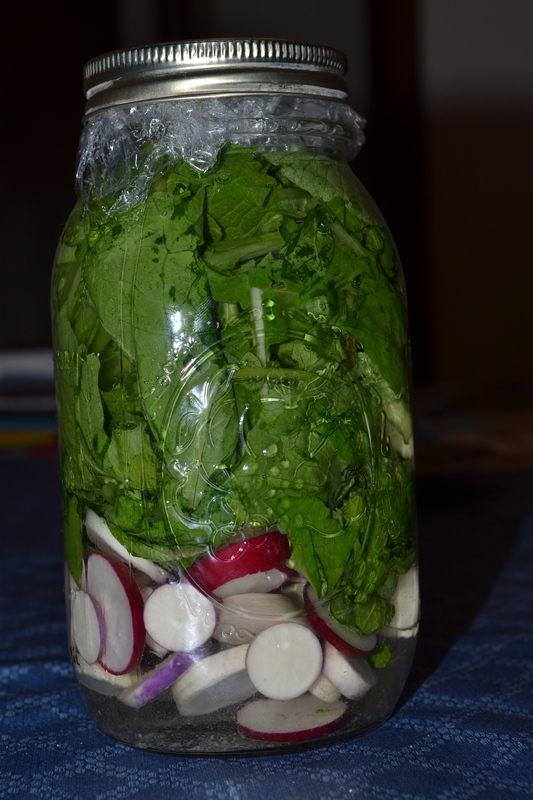 Pickled turnip and radish greens with baby turnips and radishes. This a basic recipe. There is nothing saying that you can’t add other things like pearl onions, garlic cloves, hot peppers & etc. 1) Thoroughly wash and sterilize a 1 quart mason jar. 2) Thoroughly wash enough greens to tightly pack your jar. You can use turnips, beet, chard, radish, or any other mix of greens that you like. 3) Wash and slice baby turnips to about 1/4 of an inch thick. I added young radish leaves to my version of this and so I added also sliced radishes to make an attractive presentation. 4) Pack vegetables into your quart jar. Make a pretty pattern or, if your kids are acting up the way mine were, do like I did and just STUFF the darned things in there. Reality. Straight from the hip. 5) While prepping the jar and vegetables, dissolve 50 grams of salt into 4.5 cups of water. Bring to a boil. 6) Allow the brine solution to cool to room temperature. 7) Once the 5% brine solution is at room temperature, pour over the vegetables you’ve packed into the sterilized quart jar. IMPORTANT: because your liquid is at room temperature, your leafy greens will not wilt and sink. Instead, they will float. It is imperative that they be completely submerged in the brine solution. You can achieve this by inserting a folded “pad” of saran wrap into the mouth of the jar and weighing it down with about 1/4 cup of the reserved brine. 8) Place a cap on the jar and very very very loosely secure it with a ring. Because the pickling process will produce carbon dioxide, the jar lid needs to be very loose to allow gases to escape. You may see salt crystals accumulating on the jar as the brining process progresses. If this becomes annoying, simply wipe it away with a damp paper towel. 9) Place the pickling jar in a cool location where temperatures NEVER meet 80 degrees Fahrenheit (about 25 degrees Celcius). The ideal brining temperature is between 70 and 78 degrees. When the temperature meets and exceeds 80 degrees, bacteria will begin to proliferate in the brine and ruin your product. This is why traditionally, pickling is done in the autumn. If your temperatures are going to go in the 80s, it is alright to temporarily place your turnips in the refrigerator. They will brine properly there, but it may take months to get a finished product. 10) Allow vegetables to pickle for 7 days. The brine in the jar should remain transparent. Cloudiness indicates bacterial growth. In this case, discard the product and start afresh. You can also check the jar for odors by opening it every two days. The contents will begin to smell “vinegar-like” in the first two days, with strong overtones of turnip. Any “off” or foul odors (these are very obvious) indicate bacterial growth. In this case, discard the product and start afresh. In a 5% brine solution, with temperatures below 80 degrees, the likelihood of a batch “going off” is very low. You should not be “nervous” about this method of pickling. 11) Your product will be properly pickled after 7 days, although the flavors will grow richer or more complex the longer it takes you to consume your pickles. You may store finished pickled either in the refrigerator or in a cool storeroom, basement, cellar or pantry. Unlike the previous recipe, these greens must cure in the refrigerator, and remain in the refrigerator until consumed. This a basic recipe. There is nothing saying that you can’t add other things like fresh lemon peel, sliced ginger, or sliced fennel bulb or seeds. 2) Thoroughly wash enough greens to tightly pack your jar. You can use turnips, beet, chard, radish, or any other mix of green that you like. 3) Wash and slice baby turnips to about 1/4 of an inch thick. I added young beet leaves to my version of this which is what gives it the beautiful purple color. 4) Pack vegetables into quart jar. Make a pretty pattern or, if your kids are acting up the way mine were, do like I did and just STUFF the darned things in there. Reality. Straight from the hip. 5) While you are preparing your vegetables, bring 4 cups of water, 1/2 cup white vinegar, 1 teaspoon of salt and 1 pinch of chopped chili pepper (remove seeds) to a boil. 6) Pour boiling water over vegetables, filling the jar. The vegetables will wilt slightly and sink, so you don’t have to worry about making sure the top is submerged beneath the vinegar/brine solution. 7) Cap and ring the jar, then refrigerate. You can “taste” these pickles after 30 days, but it will likely take longer for the full flavor to develop. 8) Keep refrigerated at all times. For more on brining, salting, and smoking see the wonderful book: Charcuterie: the Craft of Salting, Smoking, and Curing by Michael Ruhlman and Brian Polcyn. It will open your eyes to amazing possibilities. I tell you what, the first time you brine your own bacon you will NEVER buy bacon in the grocery store again!! This entry was posted in Garden Journal Entries, Photo-Journals, Recipes and tagged Gardening, List of organic gardening and farming topics, organic gardening, pickle recipes, Turnip greens, Vegetable, vegetable gardening. I’m glad you enjoyed my post and my pics. You are so kind to let me know. Please take careful care of yourself during the taifun season! I’m excited to try these! I’ll have plenty of radishes and greens soon. 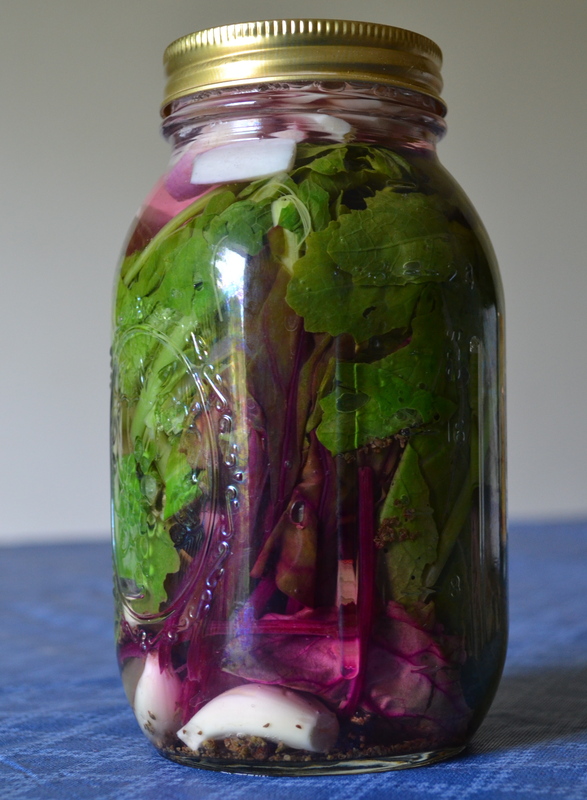 Just placed my radishes and radish greens into the brine jars. Cant wait to see how adding different amounts of raw garlic, peppercorns and red pepper chili flakes will affect the flavors over the next months. Hello there! Both of these recipes require you to keep your pickles *in the refrigerator. * They will last indefinitely, so long as they were properly prepared. I would use neither of these recipes for *canning* pickled greens. I do have a canned pickled greens recipe, but it isn’t listed here. Have fun! So I shouldn’t be throwing the greens from my beets in the compost pile? Oops! I don’t grow them but by them at the farmers market and they’re a bit wilted when I buy them. The greens, not the beets. What else do you pickle? A fresh beet green is a lovely vegetable, especially when they are young and still tender. I believe I have a recipe in my “Sistuh’s Kitchen” section that explains how to prepare a Wilted Turnip Green dish. I actually prefer wilted beet greens, so I recommend trying beet greens using that recipe. Usually, beet greens are harvested by picking them off of the plant while the root is still maturing in the ground, and preparing them fairly quickly. This is why when you see them in the grocery store they are wilted and unappetizing. When I buy whole beets at the market, I ALWAYS end up composting those greens. They are too old to be tasty, I think. I pickle all sorts of things… cucumbers, of course, and beet roots (Oh Happy Day). I pickle turnips, and green tomatoes, Hungarian Peppers, and cauliflower (in years when I plant a lot). I also make chutney every now and then. I love fooling around in the kitchen, turning summer harvest into something I can enjoy in the winter.